Winter is coming, but is your footwear up to snuff? You shouldn’t be trudging through the impending snow with your canvas sneakers or suede footwear. In fact, suede, leather soles, and desert boots should all be in storage for the long, cold, and wet months ahead. Instead, break out the rubberised boots and Vibram outsoles. Keep reading to see the only boots heavy duty enough for the ice and snow. www.jcrew.com and viberg.comLEFT: Alden 405 Indy ($US523); RIGHT: Viberg ($US720). These are the boots you’ll want to wear when it’s iffy outside, but you still want to look nice. Modelled after work boot styles from last century, these will last you miles and miles. What really separates these from the typical boot is that they don’t have a leather sole, which you commonly see with Chelsea boots and some brogue styles. Leather soles are awful for winter because they provide zero traction and soak up water. Instead, these boots have rubberised Danite soles and neocork rubber hybrids, which provide much more traction. On the expensive end of the spectrum, there’s the Viberg’s Service Boot — they have a Danite sole and a very unique, slimmer profile. A little lower than that price point are favourites like Alden’s classic Indy boot with it’s neocork sole and unique toe stitching. The best value (and lowest price) is Chippewa’s Original Plain Toe Boots with a Vibram sole and classic work boot good looks. 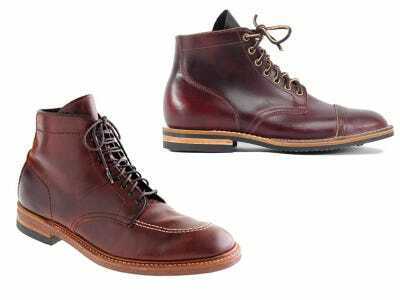 www.danner.com and www.redwingheritage.comLEFT: Danner Mountain Light II ($US310); RIGHT: Red Wing Beckman ($US340). When the weather gets a little rougher outside, you’re going to need a tougher boot. Boots with lugged soles are built to keep you from slipping on the ice and snow. They often come in work or hiking boot styles, which may not be acceptable for your work place, but are always appropriate for your commute. 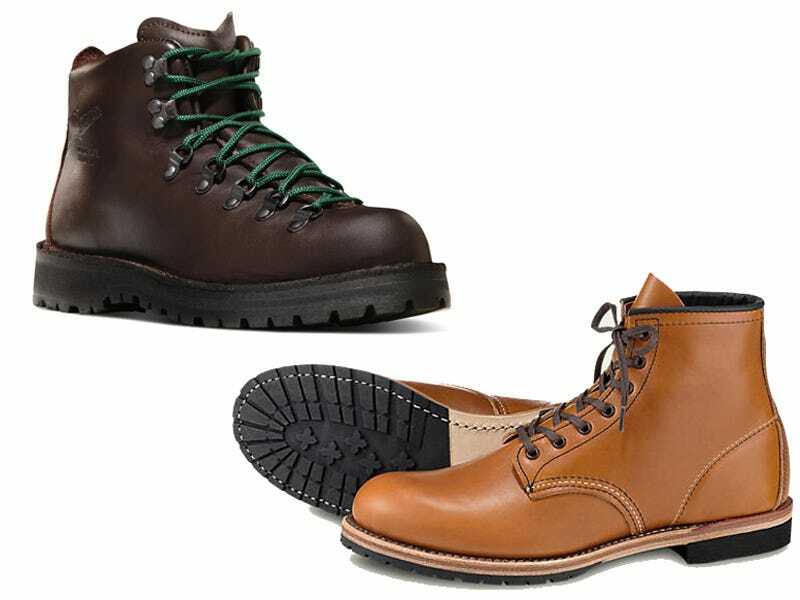 We recommend the Danner Mountain Light II, which has a hiking boot style, and the Red Wing Beckman, which is a revival of a classic work boot. Both have a long heritage of bulletproof quality boots behind them and are equipped with rubber lugged soles, providing optimal traction in the ice and snow. 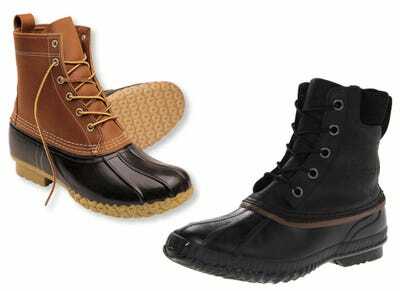 www.llbean.com and www.sorel.comLEFT: L.L. Bean Boots ($US109); RIGHT: Sorel Cheyenne Lace Up Boots ($US129). For trekking in the tundra, there’s no boot better suited to the task than the classic duck boot. The rubberised sole and tough, full grain leather uppers provide full protection from the wet and icy wilderness. These are the boots you need to wear when heavy snow is in the forecast. The go-to duck boot choice is the L.L. Bean Bean Boot, which invented the category way back in 1912. L.L. Bean still makes them and they’re still handcrafted in the company’s Maine facility. Many have attempted to copy the L.L. Bean design, and some have even comes close. The Sorel Cheyenne Lace Up Boots are a good alternative thanks to their soft inner lining (the Bean Boots don’t have a lining, but they do offer a lined version $US189).